I got a moderately decent start on the "secret project" this weekend. Again, it's secret from the blog because the recipient does on occasion read what's going on here and I don't want to ruin any surprises. I can fill you in on a few things as I work on them though, without giving away the whole goose. I am working with some beautiful white oak, I got it from my supplier very rough sawn so I've been trying to get some of the beginning pieces milled up and workable. I have never worked with such rough lumber before, and I've not worked with white oak before either and I have to say that I was very impressed with the figure and grain of the wood as my hand planes revealed what was under the rough texture. Full of beautiful iridescent ray flecks and nice straight grains. I am very impressed. Working the White Oak has been a chore though, the seller at Big River Lumber told me when I said I admitted that I had not worked with it before, that it was more fussy than red oak, and harder to work. He wasn't really wrong, I'm dulling plane blades like crazy and I have to pay a whole lot of attention to reading the grain or I get some good tear out. All these things are good for me as I'm learning how to handle the hand planes better and better every day. The biggest frustration for me this weekend has been something I knew was coming but had been trying to hold of. The building and rebuilding of various shop jigs and accessories. I had no real workbench when we made the original move out to Northern Maine so I had no real accessories for it. I was really just learning how to use it when we decided to move home to Wisconsin. To save some room in the Penske truck I held off on making some items and I also trashed a few that I knew I could easily remake. I use 3/4 inch dowel for bench dogs, so replacing those was no big deal. 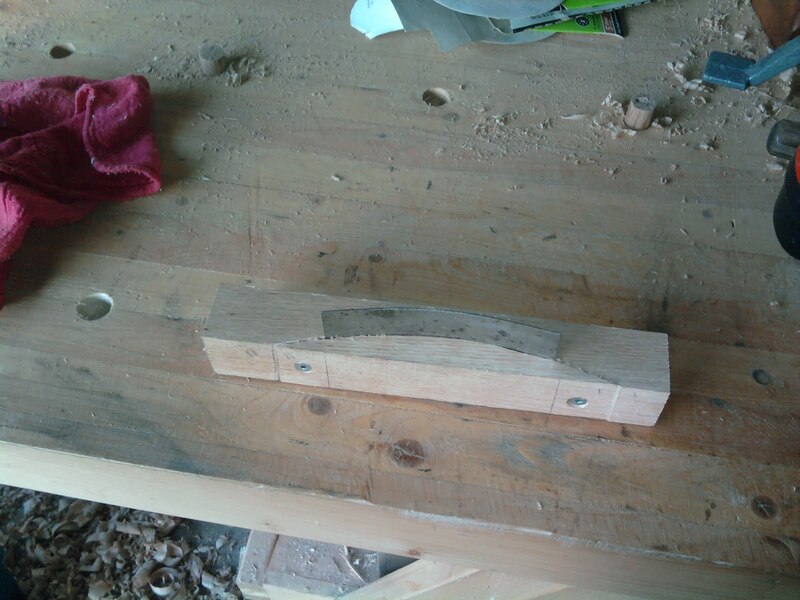 I also replaced a plane stop using a section of pine molding from a scrap pile. Just a couple of shorter pieces of dowel and some crazy glue and I was back in business. With the plane stop made I went to work getting the boards flattened. This lead to a lot of sharpening of plane blades, not a big deal as it just takes a few minutes each time, but I had to replace at least half of the abrasive paper before I got started. I should probably replace the 400 grit as well, but I'll hold of a while. At least until tomorrow. All the planing was followed up by a good amount of card scraping. I'm not sure if a lot of you out there use card scrapers instead of sanding or not, I am still getting used to them myself. (Confession: I still did touch the boards up with a the random orbit when I was done, hand tool purists ready your rotten veggies and launch at will) But to best use a card scraper you have to hold a bend in it, and that is tough on the hands. So I took another break and some red oak scrap and cut a quick and rough jig to hold the bend in the scraper while I'm using it. It works fantastic, needs a little rounding and refining yet, but it holds a good bend and makes it easier to get the work done. How did I decide on the curve. I judged about how much I flex the scraper when I use it, and I eyeballed it. Now came one of the bigger challenges, I got all the starting boards planes and flattened and I started working on trying to square up the ends. I flipped and flopped on how I was going to do it, and finally decided that I needed to make a device I should have made a while ago. a shooting board. I had some 1/2" plywood floating around and it really doesn't take a whole lot to make one but it was still one more pause in the progress. Some guys live for building jigs and appliances, things for their shop. They use the best materials they can find and fine tune s jig or appliance into a beautiful piece. I realize that a lot of the recent posts on this blog revolve around my shop, whether it's been doing the set up in Maine and building the Nicholson style workbench, to setting up shop at the Wood Shop Jr. and going through and rehabbing my hand tools to building a pair of Saw Benches and a Joiner's Bench, to now setting up the Oldwolf Workshop 5.0 and doing all that's involved in that process. Building these jigs included. But all of those things aren't me. I like to build furniture, not shop accessories, the more time I'm building jigs and appliances, the less time I'm building furniture. Taking time out for distractions in the middle of a process is never good, it only leads to something like this. Here's two boards that will eventually be opposing sides of the "secret project." As you can see once I got them onto the shooting board I realized that I skipped a step while I was sizing and surfacing, I overplaned one board on one end and didn't notice it until now. I wanted the boards to be 10 1/2" when I was done. The narrow end on top is 10 3/8". I had to close down the shop and come home earlier than I had planed. On Twitter I let loose about how I was feeling and that I was on my way home. My wonderful wife caught this on her Twitter account and when I walked through the door, she told me to go take a shower cause she was taking me out to lunch. As I write this I am still annoyed at my screw up and at the delays, but I am ready to go back and deal with them tomorrow, I have a plan, kind of . . .